For the dough 5 eggs do not beat, just mix with 1 Cup sugar. Now add 1 Cup flour and 1 pack of cocoa (100g), mix everything into a homogeneous mass. Add to the dough 1 part-a glass of kefir and a bit more flour. Mix thoroughly. The dough should have the consistency to resemble thick cream. Divide the dough into two pieces, pour one portion of the dough into the form and bake until done. Then bake the second cake. Then the cakes should be cool. The cooled cake cut in half. The two halves of leave, and two halves of a cut (or break) into small pieces. 0.5 l whisk sour cream with 1 Cup sugar. Three packs of gelatin diluted with boiled water, and after it is dissolved add in the sour cream. 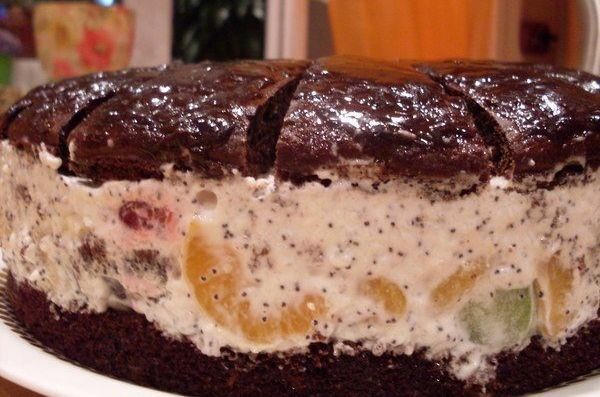 Sour cream for this cake it is better to take fatter. Cut 2 banana, orange and kiwi (or peach) to average pieces. If you want you can take any other fruit: pineapple, apricot, strawberry, etc. Mix chopped fruit, sour cream, 1 packet of poppy seeds and pieces with two layers. In the form in which it was baked cakes, put one half of the cake (this circle will be the bottom cake, then fruit and sour cream mass with pieces of cake (the middle of the cake). On top of all this cover is cut in the shape of a Daisy cake. Put in the fridge for an hour to the cake well soaked. Daisy petals can be lubricated chocolate fondant, icing or fill light fruit jelly, but without it the cake can be considered ready to eat.